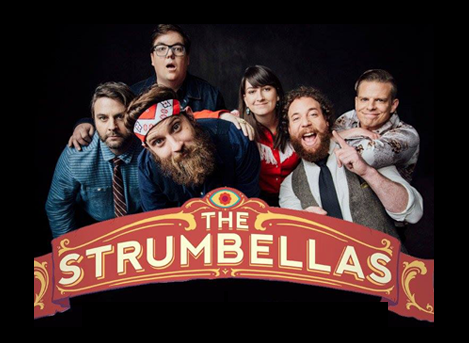 The Strumbellas, coming off of a banner few years, show no sign of their stride shortening. The group released Hope in 2016, which spawned the massive hit “Spirits,”. The single hit No. 1 on the Billboard Alternative Songs chart and made sizable dents in Germany, Canada, Italy and France. Amid touring the world, they won the iHeartRadio Music award for Best New Alternative Rock Artist of the Year in 2017, and collected the JUNO Award for Single of the Year ahead of Drake, The Weeknd and Shawn Mendes. Rattlesnake, releasing March 29 via Glassnote, is a testament to Simon Ward’s personal growth and evolution as told through nine emboldened tracks. The album, recorded on the band’s home turf in Kingston and Toronto, Ontario, is a musical step forward from the to-the-rafters scrappy folk aesthetic of their earlier work. For the album, The Strumbellas, made up of Ward (lead vocals, acoustic guitar), David Ritter (keys), Jeremy Drury (drums/percussion), Isabel Ritchie (strings), Jon Hembrey (electric guitar) and Darryl James (bass), teamed up with producer Tim Pagnotta (Walk the Moon, Elle King) and co-producer Brian Phillips, with the goal to capture the electricity of their live show with a decidedly more stylistic upbeat bent. In 2014, Scott Helman announced himself to the world with the release of the track “Bungalow” as the first single from his debut EP Augusta. The song introduced a fresh new voice to the musical landscape and his versatility led to tours across Canada, playing with the likes of Tegan and Sara, Shawn Mendes and Matthew Good. Opening for Walk Off The Earth on extensive tours of the U.S. and Europe, Scott stood alone on stage and, night after night, won over skeptical audiences and began building an international fan base. In 2015, Scott beat out 11 other artists to be the first to win Spotify Canada’s Emerge program and in January 2016, he topped the Teen Vogue list of voices to look out for that year over the likes of Melanie Martinez and Elle King. By the time Scott went back in to the studio to begin work on Hôtel de Ville he had been nominated for a 2015 MuchMusic Video Award and two 2016 Juno Awards and performed to massive national TV audiences on both award shows.